I invite you to please stop by Micaela Gallery on Thursday night and check out my new series of drawings and an interactive robotic drawing installation in collaboration with Bay Area artists Jonathan Grover and Jake Coolidge. All the best in the in the New Year and hope to see you on Thursday! SAN FRANCISCO, CALIFORNIA – 4 January 2010 (for immediate release) Micaëla Gallery is proud to present “THAI BUI with PETER FOUCAULT + FRIENDS,” a multi-media exhibition showcasing artworks by Thai Bui and Peter Foucault. “THAI BUI with PETER FOUCAULT + FRIENDS” introduces new work by artists Thai Bui and Peter Foucault (with collaborators, Jonathan Glover and Jake Coolidge), and reintroduces earlier works by both artists. 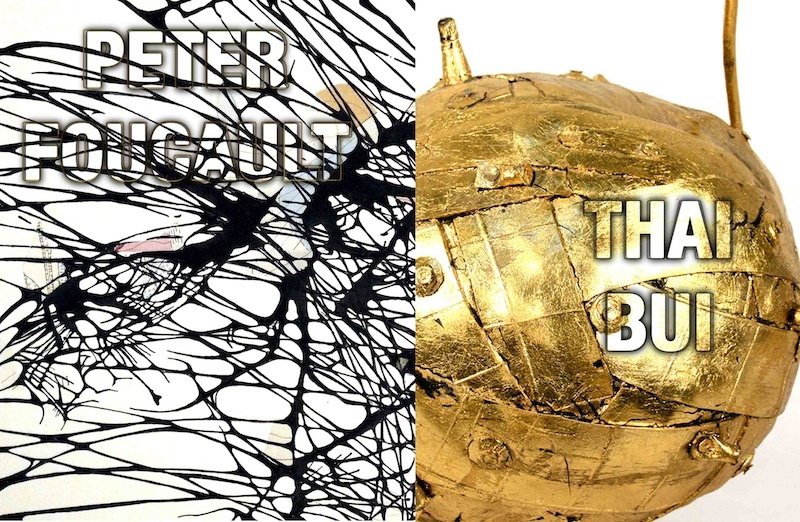 Shown in context and in collaboration, the works respond to ideas of community and time with Bui’s installation of “Don’t Pressure Me” sculptures and Foucault’s “Attraction/Repulsion:Redux II”. Thai Bui’s sculptures are ongoing projects that combine the elegance of Nature’s forms with the phenomenon of unlikely bonding. He views his work as a symbolic unification of opposing forces, a visual description of positive and negative ideas. Bui’s use of Haiku to organize his work, introduces profound and disciplined energy, and a poetic quality to his work. For his solo exhibition at Micaela Gallery, Bui presents works on paper and sculpture influenced by personal history and philosophies. While a sense of isolation pervades Bui’s sculptures and drawings, his work addresses the relationship of his environment with his persona. For example, Don’t Pressure Me, might be interpreted as an personalized outcry from an object’s perspective, or introspectively, as a weapon, a grenade or a bomb from Bui’s youth. Bui uses materials that chronicle aspects of his everyday life – inner tubes from his bicycle, stones from his garden, and gold from early memories. When viewed through Bui’s sculptural lens, these materials take on a new, slightly menacing aspect, referencing conflict and tension. In his quiet manner, Bui’s drawings, present introspection and freedom from his sculpture in a meditative response to natural elements. Bui received his MFA from Stanford University in 1992. He is the recipient of a Stanford University Scholarship (1990), the Harold E. Weiner Memorial Prize (San Francisco Art Institute), the Skowhegan Scholarship, and the SOBEL Scholarship. He recently returned to Viet Nam and presented a solo exhibition in Ha Noi, and has also presented his work at various exhibitions in Cupertino, San Francisco, Los Angeles, and New York. Peter Foucault creates works on paper, videos, and installations, fueled by his love of drawing and mark making. Upon receiving his MFA from the San Francisco Art Institute in 2005 he embarked on a series of Drawing-Projects, using systems he developed to produce complex abstract compositions. At the root of these projects is a constant tension between control and the loss of control. For his solo show at Micaela Gallery, Foucault presents a new series of works on paper and an interactive multi-media installation. Viewer participation plays an integral role in executing his drawings, as illustrated in his Embryo and Four-Square-Squared series. In these works, Foucault devised situations where audience interaction influenced the outcome of large compositions created by small sound-activated robots. Upon completing each event, Foucault returned to each drawing with his hand and further developed these marks, rendering form to the finished work. In the media room, Foucault will be showing Attraction/Repulsion:Redux II, an audience interactive multi-media drawing installation. At the opening event, this installation will include video and audio elements by San Francisco Bay Area artists Jonathan Grover and Jake Coolidge, and resulting in two site-specific drawings that document the collaboration. Concept driven, Foucault’s work often utilizes objects that reference printmaking and multiplicities. Pieces from his Evolution, Ex-Libris and New Math series appropriate ephemera such as antique Florentine papers and U.S. government survey maps, and respond to them as a primary abstract matrix that can be re-decoded, drawn into and transformed into a new system of information. Foucault has participated in numerous exhibitions nationwide, with recent solo shows at The SFMOMA Café, The Richmond Art Center (Richmond, CA), and Blankspace Gallery (Oakland, CA). His work has been included in group shows at the Smithsonian Institutes’ Freer and Sackler Gallery, The Portland Art Center, Ohge Ltd. (Seattle, WA), Works San Jose, and Mission 17 (San Francisco, CA). In 2007-2009 his artwork was presented on exhibition at during Art Basel Miami Beach week, the Bridge Art Fair New York, and his interactive robotic drawing installations have been presented at The NASA Aimes Research Center, The Lab (San Francisco), and the Zero1 Art and Technology Fair (San Jose, CA). Foucault is a freshly awarded grant recipient to present work at the 2010 Zero1 Art and Technology Biennial Fair in San Jose, California. Recent reviews of Foucault’s work have appeared in The San Francisco Chronicle, The SF Weekly (Pick of the Week), NBC Bay Area News, ArtWeek, Wired Magazine, Stretcher Magazine, and Artnet Magazine. In April 2009 his drawing Four Square was featured on the Cover of California Home and Design Magazine. He lives and works in Oakland, CA. The exhibition opens today, Tuesday, January 5. The opening reception, with artists in attendance, is Thursday, January 7 from 5:00 to 7:30pm. A print exhibition catalog, PDF exhibition catalog, photographs and high resolution images are available upon request. About Us: Micaëla Gallery is located at 49 Geary Street, No. 234, San Francisco, CA. Gallery hours are Tuesday through Saturday, 11am to 6pm, and by appointment. The closest BART|MUNI stop is at Montgomery Station. Public parking is available at the Sutter/Stockton Garage and the Union Square Garage.